Various catering options are available to suit all budgets. Our Paella Party is very popular, which includes a cooking demonstration. Either of our two dining rooms are available for private groups. Savor the traditional flavors of Spain and Portugal in the heart of downtown historic Fernandina Beach. Sip on homemade sangria or enjoy a glass of wine from a list of hand picked selections (International and Californian). Choose from a menu of hot and cold tapas, "just caught" fish or meat entree including the national dish of Spain, Paella. Complete your España experience with some homemade desert. 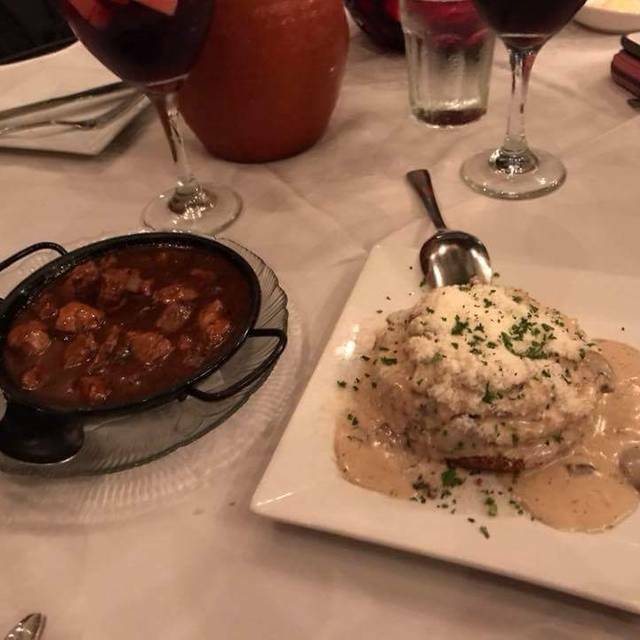 You can choose to dine in our cozy main dining room, bright enclosed patio dining room or lush garden dining which is generally open Thursday - Sunday and weather permitting :) Let us make your trip to España a memorable one. Family owned and operated since 2004. The original on Amelia Island! *Please Note: Outdoor garden seating is generally utilized on the weekends only. marinated pork tenderloin grilled and topped with shitake mushrooms and a marscarpone cheese sauce. Our paellas are cooked in a traditional Paella pan; a shallow flat pan with two handles, made in and imported from Spain . We start with extra virgin olive oil, saffron and a "sofrito", which is the combination of garlic, onion, peppers and tomato. Next, we add the seasoned meats, homemade stock and rice which are cooked together until the rice soaks up the delicate flavors of the stock. Once the rice is cooked, we garnish the paella with diced roasted peppers, English peas and fresh cilantro. 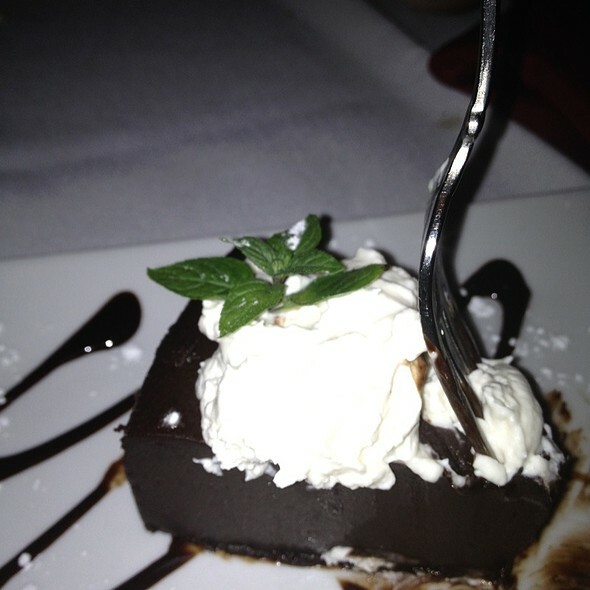 We hope that you enjoy and savor every bite! Excellent dining experience as usual. The tapas and main dishes were delicious and beautifully plated. Service was prompt and friendly. 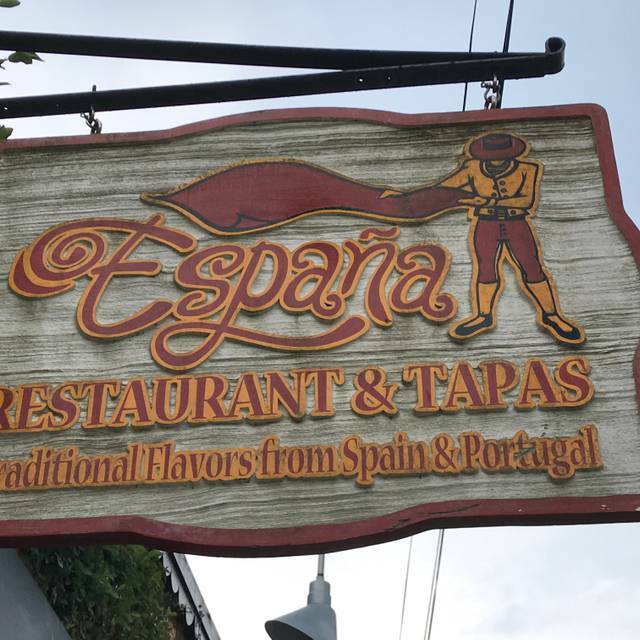 We enjoyed a wonderful dining experience at Espana in April 2019. Duartes (sp?) was our server & he made our experience awesome. His wine suggestion was amazing. We asked him for appetizer recommendations & they were wonderful as well. He was very attentive throughout the evening, refilling our wine glasses, bringing fresh warm bread to dip in our leftover sauces, and being very kind and congenial. We will definitely be back while on our trip! Overall wonderful meal. Had shrimp, calamari, empanadas tapas and split a paella, and a half pitcher of sangria. Delicious and under $50 per person. Very content, would highly recommend. Justin was a fantastic server and everything was fresh even though we went at 9pm. If you order paella remember a good paella has a soccarat, crispy, bottom layer! Great Anniversary dinner!!! Food was delicious, service was great, and nice ambience! Food was very tasty - paella did not dissapoint and service was surprisingly fast on a Friday night! The food was great and the service was top notch. I really liked the sangria (red). Great experience! Lots of food choices, and each dish came out perfect! Thought are meal was excellent, service attentive without being overbearing. It was my girlfriends first time eating there and she did nothing but rave. Duarte, our waiter, was fabulous and the tapas were perfection! 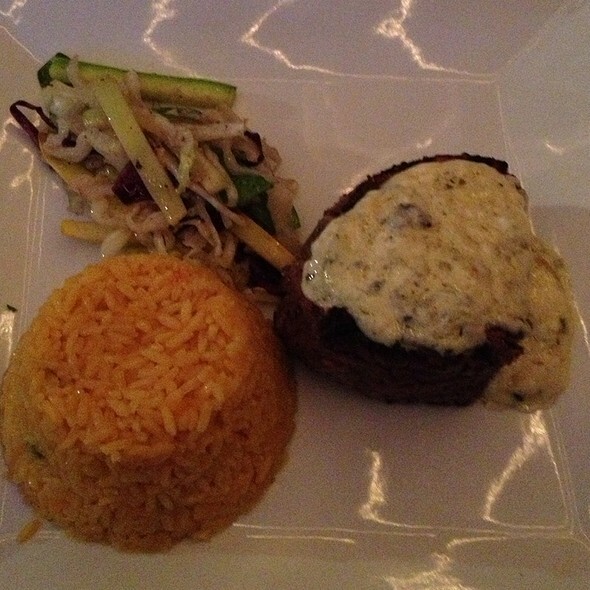 Every spring we visit Amelia Island and always make a point of having a delicious dinner at Espana. Great food, great service and great ambiance. We loved everything about this restaurant from the minute we walked in the door. 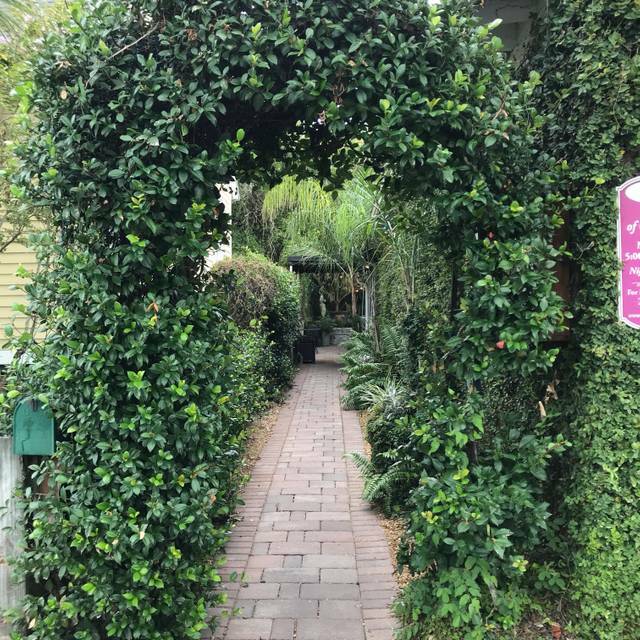 We were staying on Amelia Island and all the locals recommended it! We had a reservation for a table but after arriving 45 minutes early we were promptly seated at the four seat bar instead. What a treat! This puts you in the middle of both sides of the restaurant and getting to see what goes on behind the scenes. The entire staff was knowledgeable, friendly, eager to please, and fun to converse with. We also enjoyed speaking with the owners. They were gracious and very friendly. We ordered the garlic shrimp tapas( ask for extra bread to dip in the delicious sauce) we also had the mussels with chorizo as a special tapas that night. They were amazing! And leave room for a dessert, or maybe two. We had the tres Leche cake and the flan and we inhaled them, they were that good! The owner also makes a burnt cheesecake that was scrumptious as well! Definitely worth a stop if your in town. Absolutely one of the best Tapas restaurants we have ever experienced. Delicious food, terrific waitstaff. Wonderful selection. Very nice interior. Just a delightful and satisfying experience. We will definitely go back again. Make a Reservation. The Portuguese Fish Stew was out of this world! Service was friendly and attentive. Sangria was yummy too. Only negative was the noise level where we were seated in the front room. There were a few very loud patrons who made it difficult to have much of a conversation at our table. We will definitely be back but will know to request the back room or the patio next time. Truly an all time favorite meal! Favorite restaurant on the island! We will come again and again! Wonderful food and service. Portion for small plates was very generous. Everything we ordered was perfect. España is our favorite restaurant on the island! They never disappoint us. Our favorite restaurant. We take all of our house guests to Espana. I'd eat there every night if I could. All entrees are spectacular! One of my favorite restaurants on the island. Book reservation ahead. 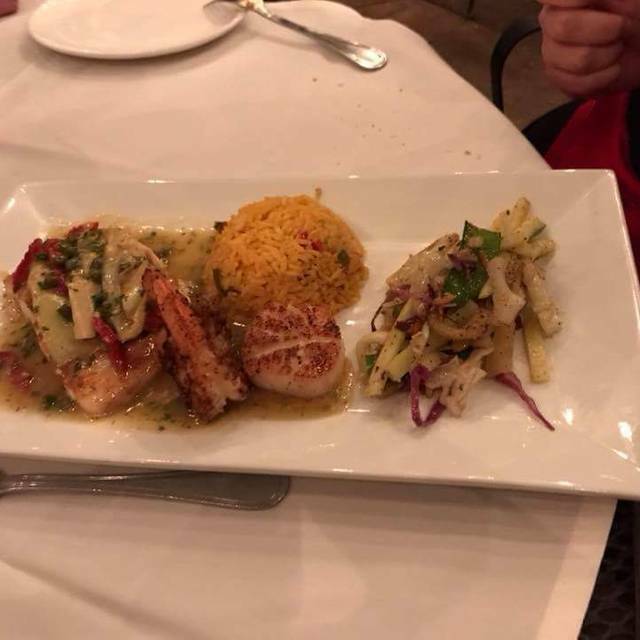 Fabulous dinner & impeccable service...the red sangria, garlic shrimp tapas and we each tried different grouper dishes were wonderful. Shared a flan for dessert: to die for. I lived in Spain for the better part of two years. It would be hard to find Spanish Food as good as this in most places in Spain. The tapas are creative and wonderfully prepared. The entrées, including three different kinds of paella and a fabulous Portuguese fish stew, are absolutely stunning. Stir in a wonderful Spanish wine list, including hard to find Proirat, and attentive service and you have a recipe for a wonderful evening at a reasonable price. 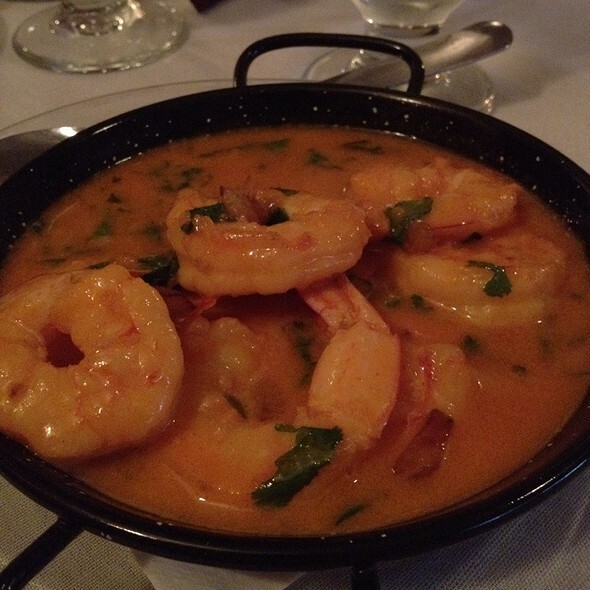 España is a little slice of Spain in Fernandina Beach. Excellent food, friendly service, loud (would have been quieter in room to the right of the door or outside), and looking forward to going back again. Excellent service, fresh food that was prepared well. Thoroughly enjoyed our evening there! and it certainly didn't disappoint. The sangria and salad were excellent. We would definitely return. Be sure to make a reservation as it was full when we went during the week. I would rate them higher but the limit is 5, so 5 it is. This was the most enjoyable part of my Amelia Island vacation. What a great find. The food was terrific and the service was warm and genuine. Absolutely do not hesitate to go there. Great place to take family, friends, or yourself for a fantastic meal. I happened to be there twice this week, and was not so happy with our server on my earlier visit, but Jonathon made up for that on Sunday night. He was OUTSTANDING! And as always, the food is great. This time we had grilled calamari-YUM, salads-YUM, Fisherman's Stew-WAY YUM, Rustica Paella-WAY YUM, Garlic chicken dish (can't remember the authentic name)-WAY WAY YUM. The chef personally greeted each table of guests and asked about their meals. Great wine list for all price points. The only thing I've ever head here that wasn't over the moon about is the sangria (but I'm kind of a sangria snob, make my own). If you haven't been GO! BUT YOU MUST MAKE RESERVATIONS! This is our little piece of Spain in the States. A delightful experience! This place is amazing! Omar, our waiter was super professional and a great server. The food was absolutely delicious. I recommend this restaurant to anyone who has an extensive, developed palate. Can't wait to return. Celebrating a birthday in Fernandina Beach. Had a great meal and highly recommend. 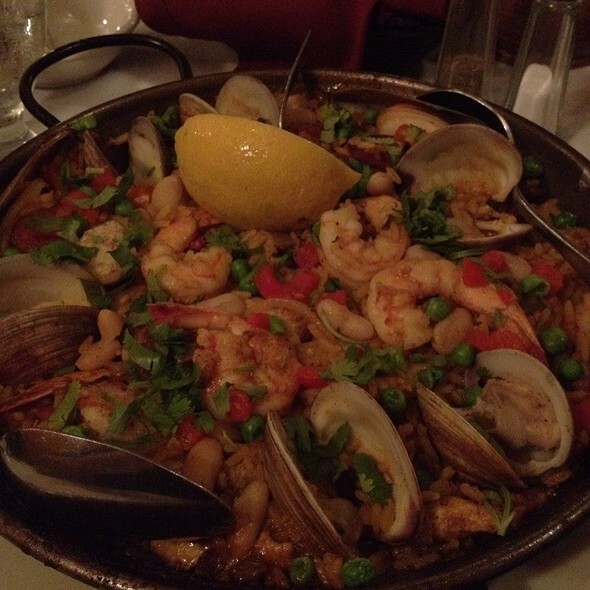 The paella was amazing, great Sangria ( large pour) and fun service and very reasonably priced. All the food being served looked great and I can’t wait to try out the rest of the menu. Beautiful outside garden if your feeling romantic, weather permitting. As always, España exceeded our expectations! Great food and service made for a wonderful evening with friends. Best Spanish restaurant experience in the USA, so far. I would highly recommend the mussels and the fish/seafood stew. They got everything right, from the taste of the food, the delicious desert to the wine selection. All of this with a reasonable price. One thing is for sure, we we’ll be back! Great food and wonderful service. Unbelievable wine selection at reasonable prices. Great food and service. Will return. Gambas Mozambique superb. A great place to enjoy great Spanish food. From meat and fish to their Paella for one or two!! Great tapas of many choices and the night we were there they served a white Sangria which was very tasty and great warm weather drink. The service was spot on!! Espana is a dining delight on Amelia. 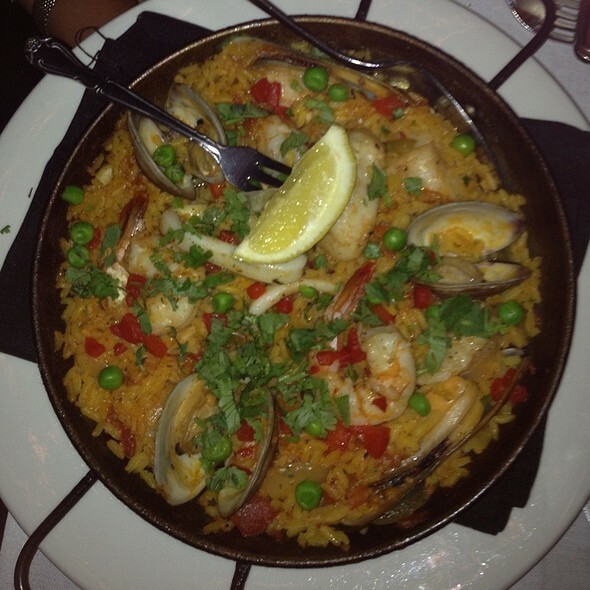 The paella is superb and fish dishes are consistently excellent. The wine list offers a well-selected array of choices at fair prices. The atmosphere is pleasant and welcoming. We asked to be seated outside but several large groups we seated in that location. Dine Espana for pleasure or special occasions or just to spoil yourself with exceptional food and drink.